Oil-Electric: Earth Day: "A mere scrap of information." Earth Day: "A mere scrap of information." Port Townsend today. "A man's life these parts often depends on a mere scrap of information." Thus spoke "Joe" - The Man with No Name - in a "Fist Full of Dollars, " the 1964 spaghetti western. As we shall see, starting with but a "with a mere scrap of information," I was able to develop today's article. 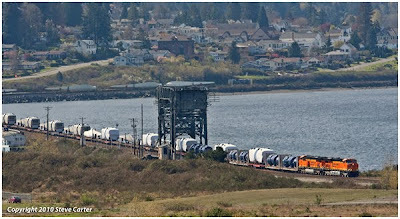 It began when I spotted a photo on Railpictures.net of a unique train heading north along Puget Sound, crossing Bridge 14 at Steilacoom Washington, taken by Steve Carter. About the time of Steve's posting, I was chatting with my sister over in Blaine. Her home literally overlooks the former Great Northern, now BNSF mainline. She mentioned she had seen an unusual train passing her place, heading north into Canada. She described it as "a string of flat cars with white plastic wrapped objects, that reminded her of kidney beans. No caboose." So what does this "mere scrap of information" have to do with Earth Day 2010? Well, it turns out the shipment was wind generator components, an alternate source of generating electricity, the perfect subject for Earth Day! When I saw Steve's posting of the BNSF train crossing Bridge 14, just north of Steilacoom, it became clear this must be the same unusual shipment my sister spoke of. But where in Canada was it going? I jumped into Google and began mining. I developed a list of wind farm sites to call in Manitoba, her vast plains being perfect for wind farms. 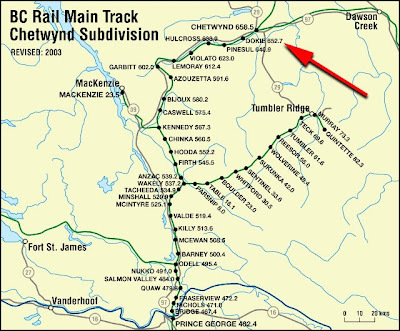 Saskatchewan was eliminated quickly; train routing through Tacoma - Seattle - Vancouver didn't make sense. Over time, I've come to the realization that in this business, when you need answers, pick up the phone. Emails seem to get lost in the clutter and are easily overlooked. After placing several phone calls to companies installing wind farms in Manitoba, a fellow at Siemens-Canada suggested I call Plutonic Corporation in Vancouver B.C. Hi Robert, this is a great photograph. We are 99% certain that this is one of our shipments. The turbine manufacturer is just checking with the port to make absolutely sure. We believe it to be Train 4, which is a shipment of 20 nacelles, 20 hubs and 5 blade sets. The final destination of this train is Chetwynd, BC and from there the cargo is unloaded and transported by truck up to a lay down area on the site. On March 7, 2011, it was announced that Plutonic Power and Magma Energy would merge to create Alterra Power Corp. The new entity — Alterra Power — owns two geothermal power plants in Iceland, and one in Nevada, one run of river hydro plant and one wind farm , Dokie 1, near Chetwynd, B.C., and an option on a solar project in Ontario. 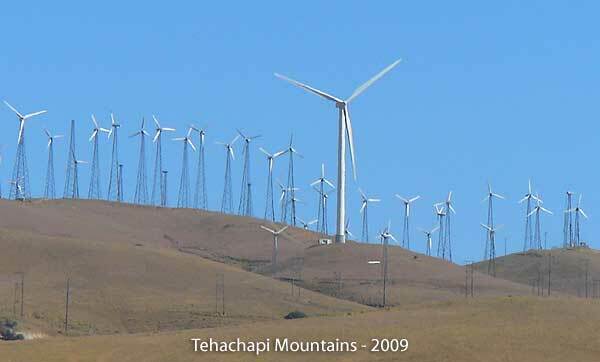 I've only seen two such installations; the experimental rotaries up at Goldendale Washington years ago, and the mammoth layout north of Palmdale California in the Tehachapi Mountains, a range that runs from the Sierra Nevada roughly NE - SW toward the California Coast. 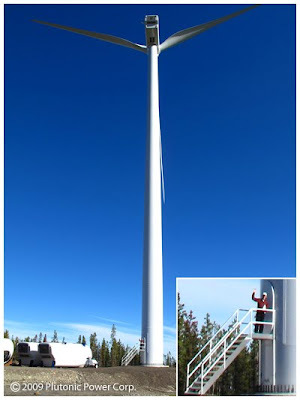 The wind machines at Goldendale were an experiment being conducted in conjunction with Boeing. This was back in the 1980's. Studies were being conducted on the incessant wind through the Columbia River Gorge. At a distance, the revolving blades look as if they are turning gracefully slow. It isn't until you get to a closer vantage point (escorted of course) do you discover these massive blades are moving right along, with a very impressive "whoosh" as the blade tip passes! 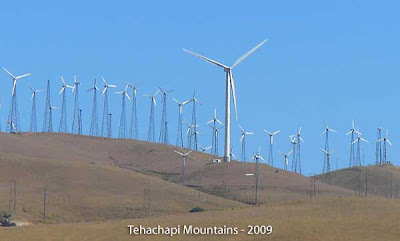 From what I learned, there are more than 1,500 windmills in the Tehachapi Mountains. The scene is very hypnotic. It gave me a feeling of being in "tune" with the earth, similar to the feeling when watching waves crashing in on a beach. The name "Dokie" rang a bell with me. 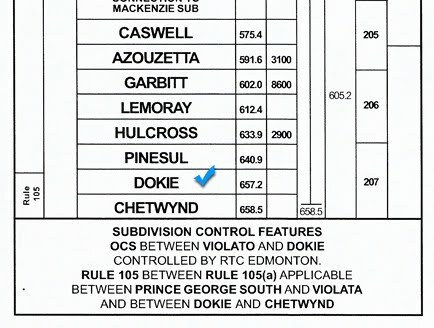 Sure enough, there was a "Dokie" on the Chetwynd Subdivision of the Pacific Great Eastern, 6 miles south of Chetwynd. It shows up today under CN management in their current employee timetable. "Hi Robert. Dokie Ridge. After a well-known local inhabitant, according to the BC Geographical Names database. In a book I co-edited with Mike Murtha, released in November, “The Forgotten Explorer,” the journals of Samuel Prescott Fay, who traveled from Jasper to Hudson's Hope in 1914. At Hudson's Hope he encountered Chief Daugie. I think this may be the same name and same person. This predated Spieker's surveys in the Peace Region, which were in the early 1920s, and it seems that Spieker used the name "Dokie." The Dokie family is still prominent in the Moberly Lake area, and there was at least one Chief Dokie." There is no doubt; soaring some 262 feet into the sky, this is one impressive structure! The CEO of Dokie Wind is shown waving from the door in the base, which gives "scale" to this pedestal. That's roughly the height of a 26 story building! And yes, just like a building, there is an elevator inside for servicing the machinery topside. This is definitely not the place to look for work if don't care for heights! Manufactured by Vestas in China, these units were shipped to Vancouver Washington, BNSF to Vancouver B.C., CN to Chetwynd and trucked to the Dokie Mountain site. 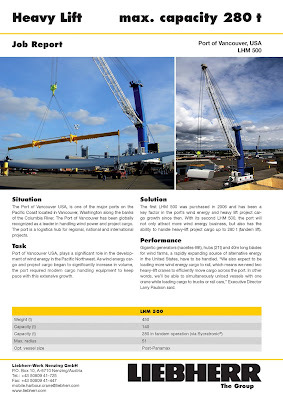 Vestas chose the Port of Vancouver (Washington) as the site for unloading components destined for several western states wind generation sites, in addition to Dokie Ridge, B.C. The Port of Vancouver invested a cool $3.2M a piece for two Liebherr LHM 500 Mobile Harbor Cranes, shown above unloading wind generator components. Quite a commitment to continued importing of wind generation equipment! Manufactured in Austria by Liebherr Cranes, they weigh 500 tons, have a tower height of 116.5 feet and a boom length of 174 feet. Powered by a 12-cylinder diesel engine, bio-diesel compatible, in compliance with the port's policy to use alternative fuels, and move around nimbly on rubber tires!The 70 ton Nacelle sits atop the tower or pedestal. It houses the pitch controls for the blades, gear box and a/c generator. Three blades are mounted to the hub. Each blade measures 144 feet in length, weighing 14.7 tons, and together, the three blades inscribe an arc 295 feet in diameter! Next time you look at a foot ball field, you will appreciate that sweep! Click on this brochure to learn more facts about the Vestas Wind Generator. There are some interesting videos included. 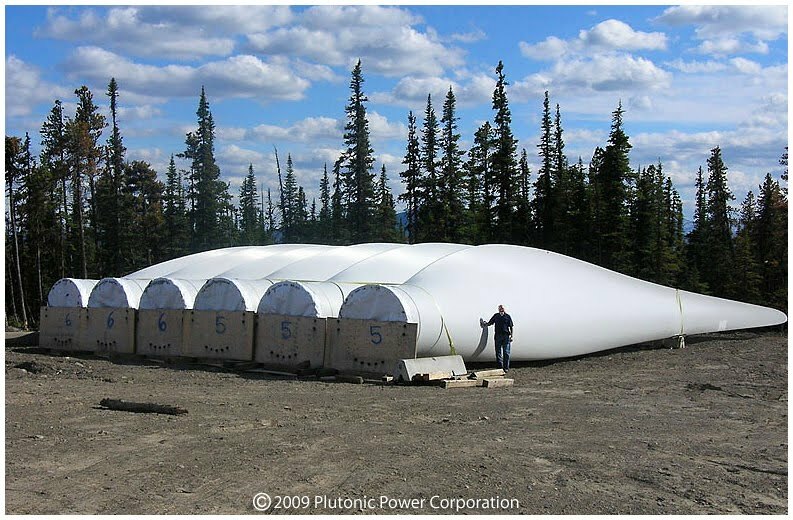 When completed by the end of this year, Plutonic will have 48 units installed up at Dokie Ridge, outputting an estimated 333GWh to BC Hydro's power grid. There are several other companies investing in wind power in B.C. Here is a complete listing of Canadian Wind Farms by province. Select "Wind Projection" for a listing by province of projects under construction. 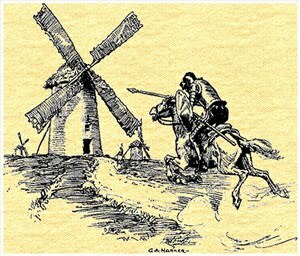 Of course, I can't let this moment go by without mentioning that for my "initiation" into Thespians in high school, I was required to do a construal of Don Quixote tilting the Windmills, accompanied by his faithful servant, Sancho. "Look yonder, friend Sancho, there are at least thirty outrageous giants, whom I intend to encounter; and, having deprived them of life, we will begin to enrich ourselves with their spoils!" Our "Thanks" to Steve Carter, whose photograph proved the catalyst for today's offering. 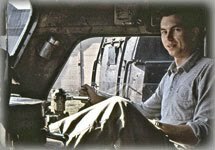 Steve displays his great range of photography on his web site. Be sure to look in the "Railroad" section for a great shot of SP 4449 crossing Bridge 14. And we appreciate the support of management and staff at Plutonic Corporation. Plutonic was generous in providing photographs, information, and enduring my never ending questions. So there you have it, the story of how a "mere scrap of information" resulted in today's story! 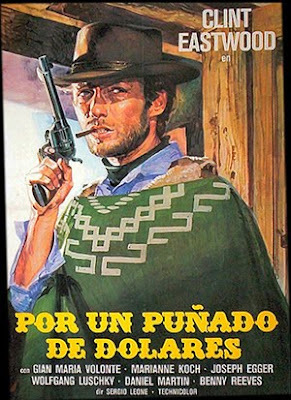 By the way, it is not commonly recalled that later in the film staring Clint Eastwood, "The Man with No Name" delivers the same message, slightly altered from the beginning of the movie: "In these parts, a man's life often depends on a mere scrap of information." Very interesting posting! Loved how you dug up all those details. 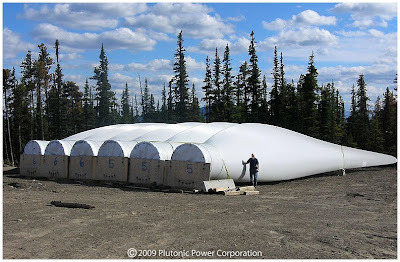 Is there not also a wind power project being installed somewhere around Whistler, BC? I thought I remembered reading about some very large shipments delivered by CN a few months ago. Go to this address for a complete listing of projects currently on line. From the LEFT margin, select "Wind Projection." There is a four page listing, including Dokie Ridge, of farms under construction up to this date. "Revolving Picture Collection - 1"